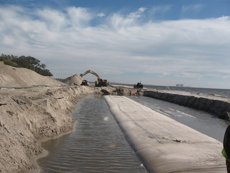 Caribbean GeoTextiles offers Geotextile Tubes and Bags for maximum solids recovery while simultaneously dewatering millions of gallons of sludge, and in less dewatering time than market standards. Our GeoTextile tubes are the innovative, cost-effective method of dewatering for commercial applications.They are also the affordable solution for removing sludge from bodies of water including lakes, rivers, inland waterways, oceans and lagoons. By employing our eco-friendly GeoTextile tubes, the process saves time and money, making it more efficient. Caribbean GeoTextiles can provide Geotextile tubes and bags throughout the Caribbean including the Trinidad & Tobago, Puerto Rico, Cayman Islands, Dominican Republic, Virgin Islands, Haiti, Bahamas, St. Lucia, Aruba and Antigua as well as Central America such as Belize, Guyana, Nicaragua, Suriname, Costa Rica, Guatemala, Grenada, Guadeloupe and Honduras. Call us today for more information about environmentally friendly GeoTextile Tubes. Our GeoTextile tubes are made of a high-strength woven fabric, and have been used in both municipal and industrial marine applications. They are a very economical solution for your Trinidad and Tobago, Puerto Rico, Bahamas or other Caribbean project, but provide an extremely effective method of solids recovery for little cost. The polymers used in making them are environmentally safe and friendly. The "spoils" excavated or removed can be used in a landfill or for reclaimed land such as making beaches. 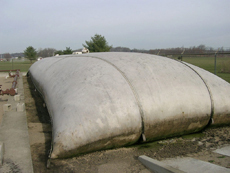 Hydraulic force is used to fill the bags through a reinforced port Environmental irrigation and flood control, river bank Sediment soil stabilization, soil conservation, Shoreline coastal beaches erosion control, Then, the sludge is solidified by the using polymers, and the geotextile tubes are left to dewater over time (separate the solids from the liquids). After this dewatering process, the tubes are opened to permit the leftover solids to be reclaimed and used in a landfill or any other area you want to create new land mass, or build up land mass in Belize, Costa Rica or other Central American country. Our geotextile tubes are extremely strong and UV resistant, and they ,come in a environmentally pleasing sand color which blends in with the surroundings. Customizing the geotextile tubes by customer criteria is expected, there are a wide range of sizes available., The bags may be sized to fit in drying beds or specific dimensions. Some clients have stacked them in a pyramid style in order to maximize a small footprint and take up less room., Our products are high quality and well constructed, and have passed a stringent quality assurance process., We offer excellent customer service and the best turnaround time in the industry. Caribbean GeoTextile Products'' Geotextile Tubes come in a pleasing sand color, and the woven fabric is rip-resistant to minimizes damage from storms or vandalism. Contact us for a free quote at 770-831-811 or email us for more information. Geotextile tubes can be customized to fit your specific job specifications. Our product is superior to any competitor and our prices are very competitive and affordable. Other areas of service are Anguilla, Barbuda, Grenada, Dominican Republic, Guadeloupe, Jamaica, Martinique, Montserrat and Suriname, St. Lucia, Bahamas, Aruba and more. We also offer installation, training or consultanting services pertaining to GeoTextile Tubes and Bags, contact SDMI dba Caribbean Geotextiles for more information 770-831-8111. 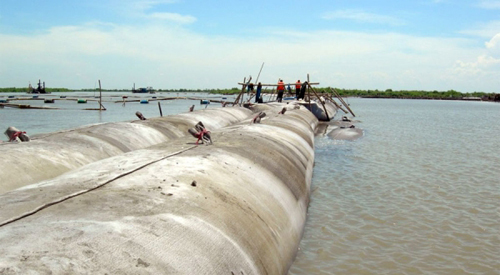 Geotextile Tubes and Bags - Dewatering, Dredging, Spoils Cell, Breakwaters, Groins, Erosion Control, Beach Renourishment and Concrete Formed Fabric Products for Revetments, Embankments, Retaining Walls, Breakwaters and Erosion Control.